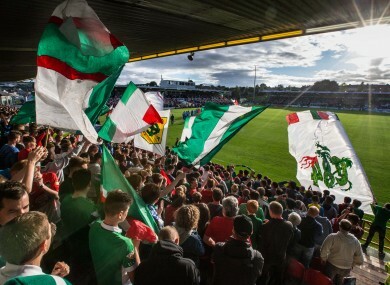 Cork City fans (file pic). IT’S A BIG night for Cork City in the Uefa Youth League. Stephen Bermingham’s men are Ireland’s first representative in Europe’s elite youth competition, and they earned a historic draw when they faced Finland’s HJK Helsinki last month. The SSE Airtricity League U19 champions emerged with a creditable 0-0 result, and were unfortunate not to come away with a win, with the return leg set to take place in Turner’s Cross tonight. The kick-off is 7pm with the club charging €5 for adults and €1 for children. A victory would likely mean a trip to face Italian giants Roma in the next round, unless Cypriot side APOEL can overcome a 3-0 deficit in the second leg of their tie tonight. Speaking to the official Airtricity League site, Bermingham said these type of games provide vital experience for his players. “Our preparation’s been excellent over the last number of weeks, so we were just waiting for the day to come and it’s now arrived, so we can’t wait. “Going into the second leg, we know exactly what to expect. They probably weren’t expecting us to be as strong as we were (in the first leg) and do as well as we did, so both teams now have a good idea of each other. Our main aim is to try to get players into the first team. Even these games in Europe… So when we look at players like Chiedozie (Ogbene), coming on the other night (for the senior side) and playing against Dundalk as well, that’s our main aim. Actually travelling away to Helsinki will really stand to them and give the players a great experience. If our first team are playing in Europe again next year, they’ll know what to expect. “Recently, it’s been a bit more difficult with the lads back in school, but over the summer we were (training) four-to-five days a week. Email “Cork City have a huge game in the Uefa Youth League tonight”. Feedback on “Cork City have a huge game in the Uefa Youth League tonight”.